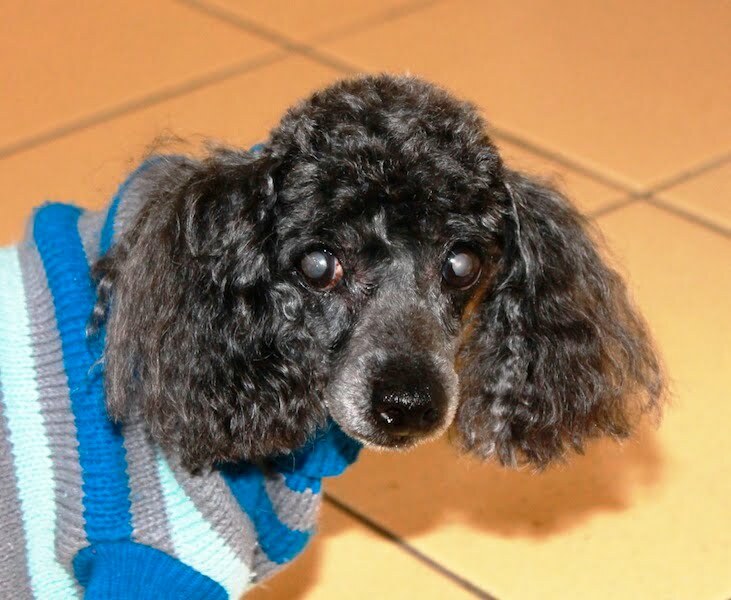 It’s quite some time since my last post and part of the reason for that is that I was caring for my much loved 16½ year old toy poodle, Merk. Without realising it a lot of my ‘spare time’ was devoted to making sure that his last months were as comfortable and enjoyable as possible. Much of this extra time was spent visiting the vet, administering medication and so on but we also spent a lot of quality time with him in the garden. I consider the laneway adjoining our property as an extension of our garden as we planted the garden beds and do the maintenance. 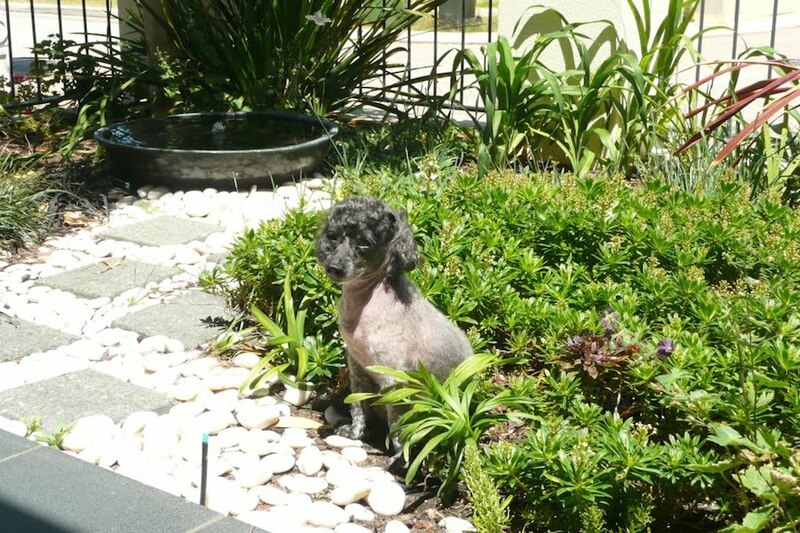 Merk passed away a few weeks ago so it is perhaps fitting that as I resume blogging again I share some of my observations of how Merk interacted with the garden over the years. Soon after we brought Merk home we installed a doggie door so that he could go outside whenever he felt like it. 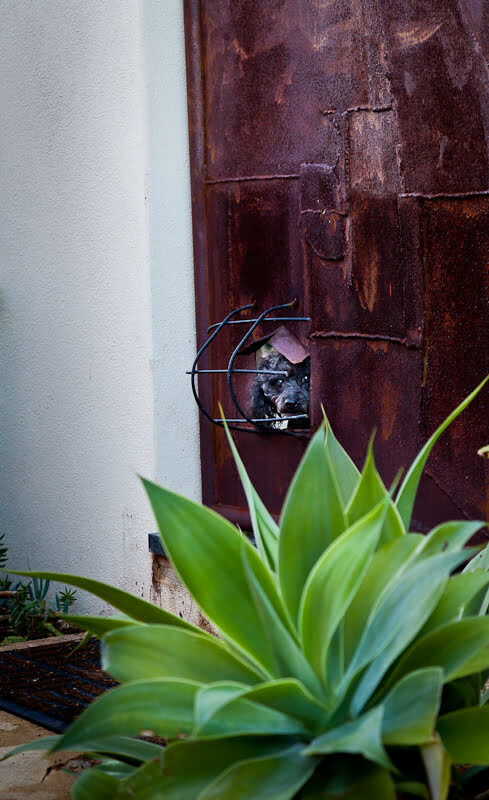 His days of leaping through his doggie door in a single bound were long gone but over the years little steps were added to both sides of his door (I knew those sample pavers would come in handy for something) so that he could still independently access the courtyard as he pleased. On sunny winter’s days he would go outside to soak up the winter sun and at other times he would just sniff the air, give a few barks and then head back inside. At the slightest noise in the laneway he would race outside so that he could bark at dogs (and their owners) trespassing on ‘his’ laneway. From the safety of our courtyard he would poke his head through the courtyard gate and bark so ferociously that people imagined that he was bigger than he really was. It was perhaps a good thing that he went deaf before his physical health and eyesight deteriorated as he would have found it extremely frustrating not to be able to get to the gate before the trespassers had passed by. As his eyesight declined there were occasions when he just couldn’t find the doggie door quickly enough to heed the call of nature so to avoid mishaps inside the house he was taken outside as soon as he woke up and regularly throughout the day. Sometimes he also had difficulty finding his way back in through the doggie door so the main door was left open for him. Initially he couldn’t find this door either but eventually he was able to get his bearings because he learnt that there was timber decking in front of the door whereas there was paving on either side. By using his sense of touch he was able to discern the change in texture underfoot. Placing a mat of a contrasting texture in front of the door would no doubt achieve the same affect. I used a similar theory when I designed a garden for a young blind dog some years ago. This particular garden was to have a large area of lawn for the dog to run on as he was still very active but along one side of the lawn was a raised deck which adjoined the living area of the house. I designed a pebble bed to separate the lawn from the deck so that the dog would be alerted to the hazard of the raised deck by detecting the change of surface underfoot. It was only in later years that Merk had difficulty finding the doorway. 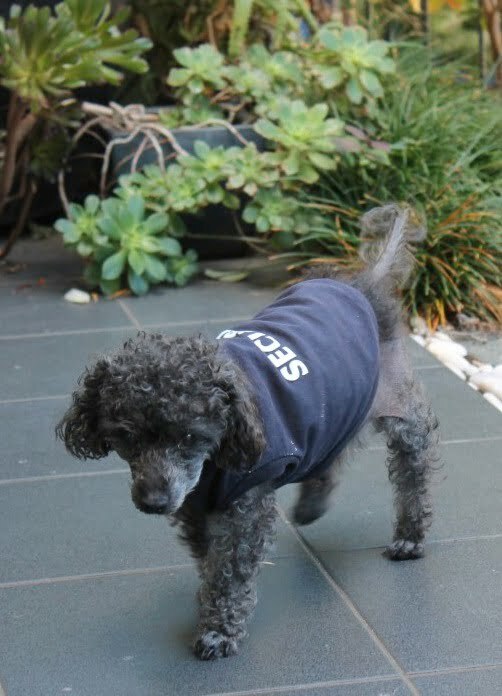 As a young dog Merk would run up the flight of 16 stairs without missing a beat but eventually the three steps leading from the courtyard to the laneway would present a problem for him. When he first stumbled at the steps I thought that perhaps he was getting too frail to manage them but it was more likely due the fact that with his failing eyesight he couldn’t accurately perceive depth or distance. He was able to adjust to climbing 2 steps on a good day but going down was a different matter and he had to be carried. Fortunately Merk knew where the steps were and he avoided them unless I was with him. If that hadn’t been the case then I would certainly have barricaded the steps off. First priority when getting back from the groomer’s – have a wee. Second priority – get rid of those ribbons…. those ribbons!! Merk developed an ulcer on his eye on a couple of occasions. It is possible that with his limited vision he accidently scratched his eye on some foliage and because of his age the wound didn’t heal as quickly as it would normally. Not only were the ulcers very painful but they also made his eye extremely sensitive to light and wind which seriously curtailed his enjoyment of being in the garden. Ideally I would have only taken him outside when the light level was low but that wasn’t practical. Sometimes just shielding his eyes with my hand would be sufficient to enable us to get to the shade of a tree. At other times I would place a wide bandaid loosely over his eye (obviously not touching the eye itself) which would function like a blinker worn by a horse, allowing him to see with the small amount of sight that he had but substantially reducing the glare. I did consider buying dog goggles (called doggles) to reduce glare and to protect his eyes from coming in contact with vegetation but his eyes healed so there wasn’t as much need for them. 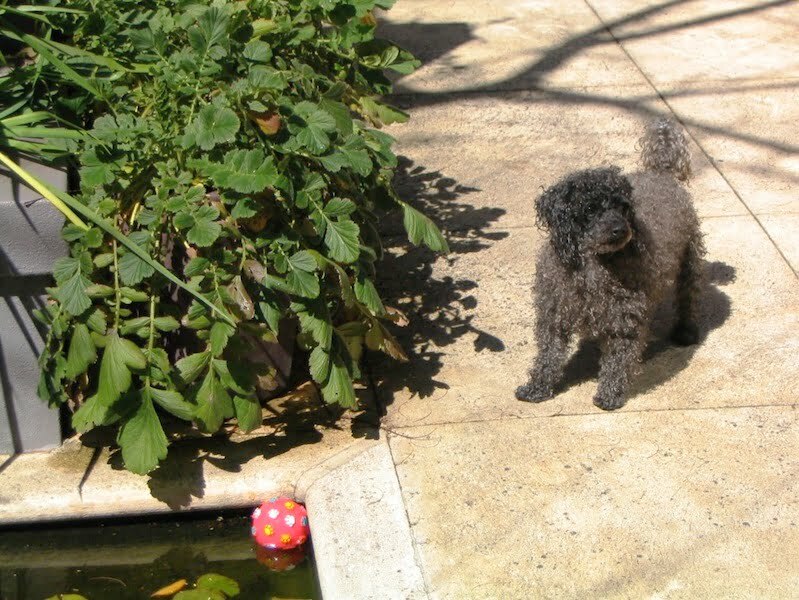 Not long before he died I did buy what is called a Puppy Play Pen which came in very handy inside the house and I imagined that as the summer heat faded he would have enjoyed spending a half hour or so in the courtyard. By this time he had got to the stage where he would bump into things so it was convenient to have his bed, food and water all within the pen, not forgetting a Puppy Training Pad for emergencies. Merk learned at a young age not to go too close to the pond. Below ground ponds and pools can be a hazard to both young puppies and old dogs. Merk was rescued from my garden pond on one occasion when he was a very young pup but he managed to avoid any further dramas for the next 13yrs or so until the pond was taken out. Thankfully this was one less thing to worry about when he was old and a bit unsteady on his feet. At least the fish were safe while he was around because if he saw an egret sizing up its prey he would be outside in flash, barking with indignation at the intrusion. On the other hand if he came across a frog sunbathing on the paving he would just give it a little sniff then dismissively walk away. Snails received the same treatment. Many geriatric dogs are on heart medication and diuretics which causes them to drink a lot of water and pass a lot of urine. 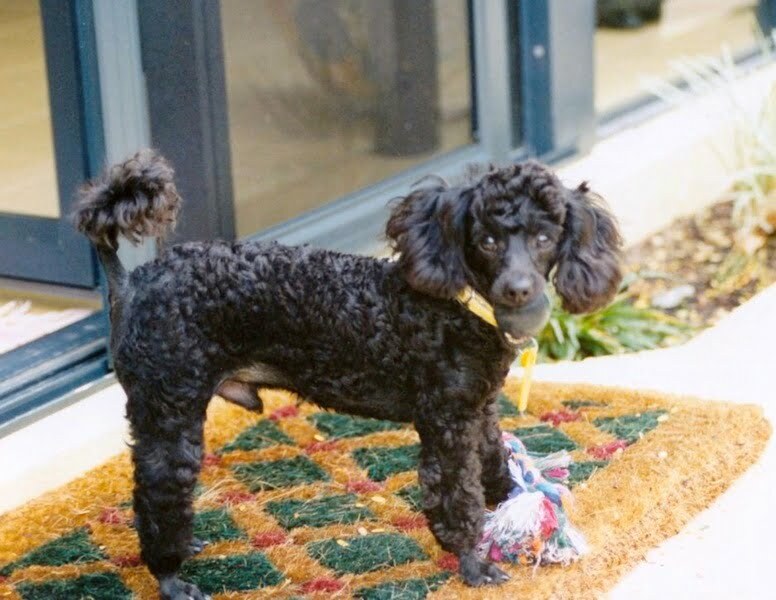 Merk was in this category and let me say that even a tiny toy poodle can produce an awful lot of piddle. This was more of a problem for me than it was for him. Frequent peeing on the paving over the summer months can quickly produce an unpleasant odour and, as all dog owners know, peeing repeatedly on the same patch of garden will cause the plants die. 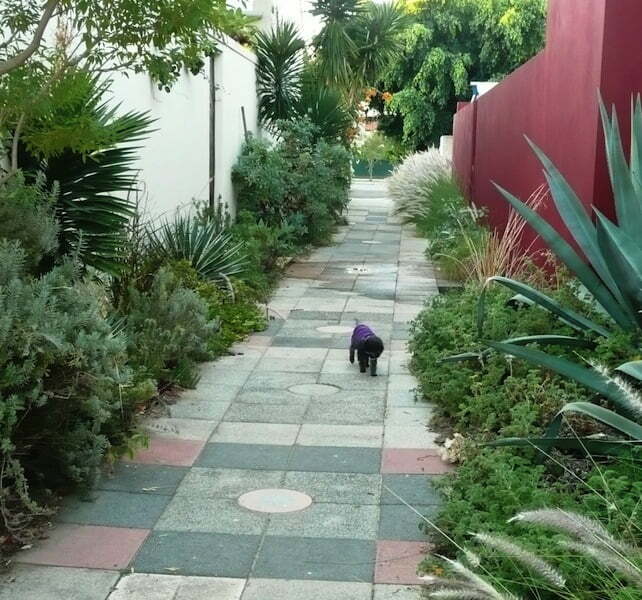 To avoid these problems I would take Merk to different spots around the garden and in the laneway. If he was in a hurry the courtyard paving would have to do, if I was in a hurry to go out then the bollard in the laneway would normally get a quick result from him as he tried to mark his territory, before bed it was often the raised garden beds in the courtyard, in the middle of the night it could be the front garden, if his eyes were bad or it was very hot then we made for the shade of the trees and so on. The spikey foliage had either been removed or pruned by the time Merk lost his sight. The most frequent place for him to answer nature’s call was the laneway and although we would trawl up and down numerous times during the day, his favourite time was the late afternoon or early evening when he would wander along sniffing at every plant to determine which dogs had been in “his” territory. Although I had removed some of the spikiest plants and pruned the sharp tips off of others I still had to make sure that he didn’t come to any harm. During his evening stroll he would meet other dogs and I would chat with their owners, neighbours and passers’ by. I often felt that he prolonged these little sojourns for as long as possible, knowing that I would most likely take him inside as soon as he had performed the task at hand. I can’t say I blamed him as it was pleasant interlude and he was always the centre of attention. 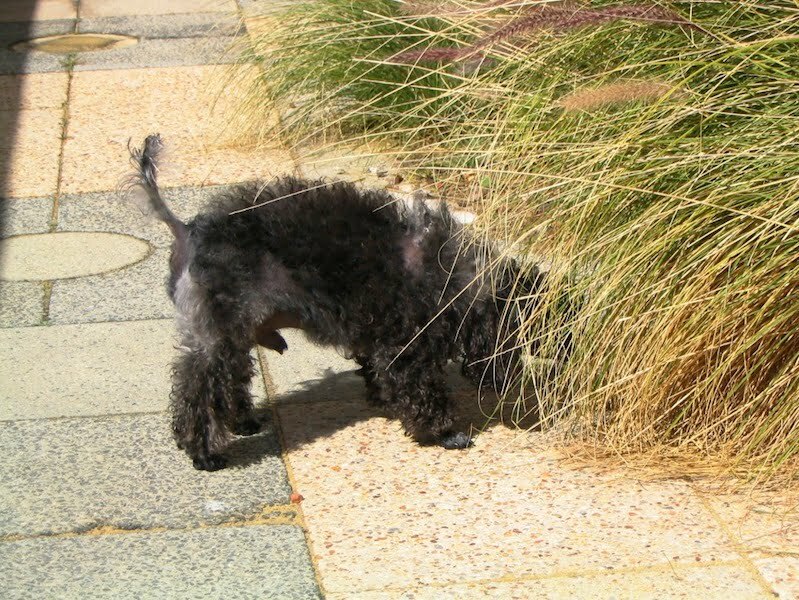 When I was considering doing this post I thought it would be along the lines of ‘ways to make the garden safe for geriatric dogs’ but during the process of writing I realised that the aging process causes both the dogs and their owners to continually adapt to their new circumstances and that the circumstances are different for each individual dog. As a result of this realisation the post has morphed into a more personal account than was initially intended. Merk proved that old dogs do learn new tricks as he constantly adapted to the challenges of growing old and infirm. He did require a lot more attention over the last months of his life but we were happy to give it as he had given us so much pleasure during his long life. Thanks for sharing about Merk and his garden. It was a little bit hard to write but looking back through the photos brought back lot of happy memories. I enjoyed your post Linda. I have an ageing black labrador and can relate to those things you are describing. He hasn’t lost his site, but is certainly struggling with steps due to bad arthritis. It makes you think about how many functions the one garden has, and the needs of multiple people/animals that need to be taken into account. 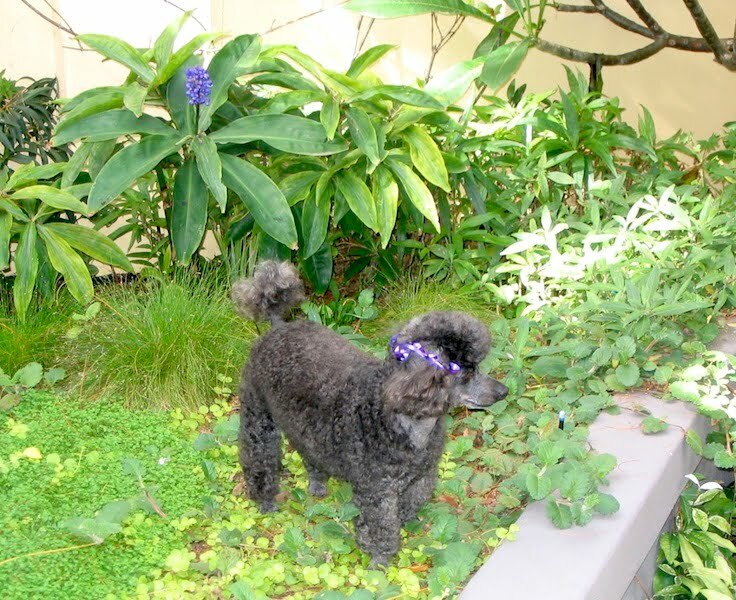 Yes each new phase of our pets lives calls for new strategies to allow them to enjoy the garden. I hope your dog enjoys your garden for some time to come, even if he is just sitting on a comfy cushion in the warm sunshine. A lovely blog Linda. I’ve had many old animals, a series of them, cats, dogs all buried in the garden even horses in the paddock! Currently have a 10 year old greyhound and he thoroughly enjoys a run albeit not so far or fast. You gave Merk a great life. He was a lucky dog. You obviously have a big garden! and a big love of animals so I think your greyhound is a lucky dog too.